In the 20-minute premiere episode, comedian and show creator James Corden joins Will Smith on a tour through Los Angeles, where they sing along to their favorite songs, chat and take on a few surprises. Though most "Carpool Karaoke" episodes will not feature a host, the Smith installment feels very much like an extended version of the segment made popular by The Late Late Show with James Corden. 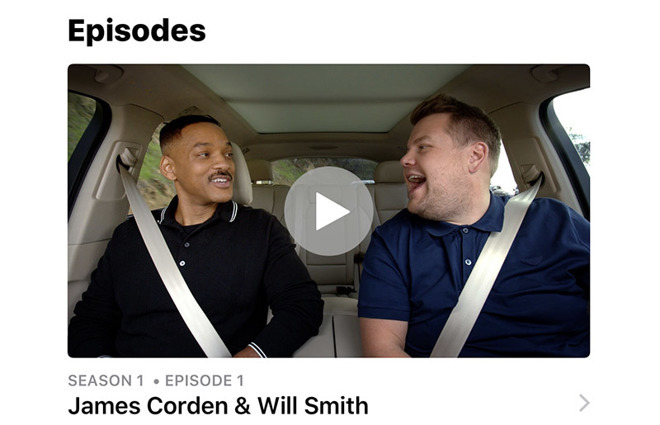 Between witty repartee, and of course in-car karaoke, Corden falls back into his usual role, peppering Smith with questions about songs like "Gettin' Jiggy Wit It" and the theme to The Fresh Prince of Bel-Air. Future episodes are expected to take on a more free flowing format, as pairings include movie stars, entertainers, athletes and musicians. There are, however, at least two seasoned talk show hosts in the mix with Chelsea Handler and Trevor Noah, who filmed segments with Blake Shelton and Shakira, respectively. Still, the Apple Music version of "Karaoke" is expected to deviate from the Late Late Show's Q&A style. The premiere comes after months of delays. Apple first announced work on the "Karaoke" spinoff last July, and later set a release date in March of this year. Most recently, Apple postponed launch in April. Apple on Tuesday also posted new TV ads for two upcoming episodes, one featuring Alicia Keys and John Legend with guests Taraji P. Henderson and Corden, and another starring Billy Eichner and Metallica. "Karaoke's" 16 episodes are slated to feature a laundry list of celebrities including Metallica, Shaquille O'Neal, John Legend, John Cena, Ariana Grande, Game of Thrones co-stars Maisie Williams and Sophie Turner, the Cyrus family, Queen Latifah, Jada Pinkett-Smith, Joe Jonas, Ice Cube and more. "Carpool Karaoke: The Series" is available for streaming on Apple Music. Subsequent episodes will air each week, identical to the release format of Apple's first original series, "Planet of the Apps."